There are many ways for science to benefit the riches of nature. Research can show the values of nature, which can motivate its conservation. Studies can also help turn motivation into practical conservation. Members in the European Sustainable Use Specialist Group of IUCN (the International Union for Conservation of Nature) designed such projects to prepare for Naturalliance. 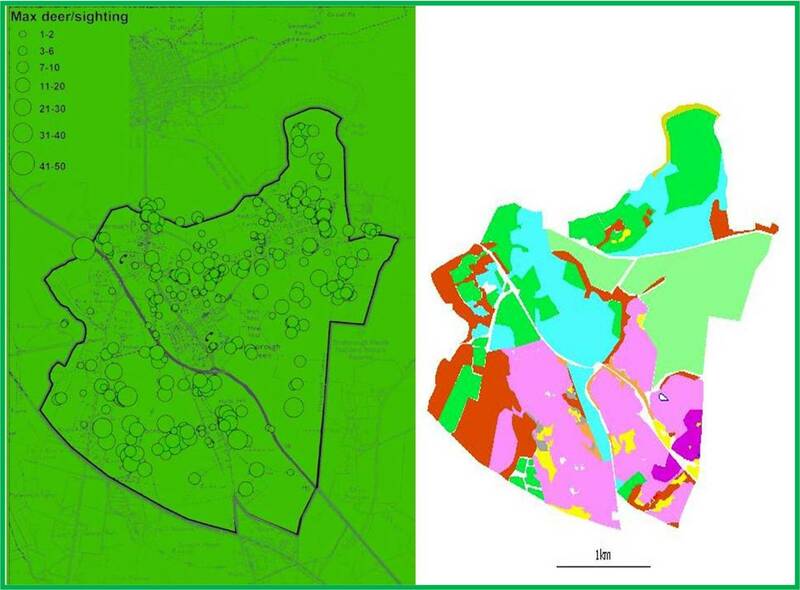 Deer sightings (left) and habitats (right) mapped by residents of a local UK community. In these projects, the European Commission funded scientists from many countries to work together. One project found that more than 30 million participants in activities which depend on the riches of nature were spending at least €40 billion on angling, hunting and going bird watching in Europe each year. A second project showed even more rural people to be gathering wild growth, using the countryside for exercise or feeding wildlife in order to watch it at home (see link below to Topic page). Case studies found that such people were strongly motivated to monitor species and map local habitats. Moreover, the countries where officials made most assessments to prevent harmful environmental impacts tended to be those where rural administrations perceived most value in natural resources. Naturalliance will provide support for decisions that affect the riches of nature, and for citizen science that records the results of such decisions. The exchange of information will eventually occur mostly through mapping. As a start, we therefore provide a mapping tool and some links, on Opportunities pages for Farming, Angling, Reserves, Government & Communities, to the 10 models considered most usable by managers with no science training. We want to provide more models fit for any user. Those listed as Opportunities for Science might one day be suitable. Please help add others to the TESS database. There is a link to that below, and to other sites for inspirational citizen science. See the Topic introduction page for the survey of rural activities across Europe. Consider recommendations of the research to design a Transactional Environmental Support System. Projects based in Cornell University of Ornithology have had major funding from National Science Foundation.